Unlike other foods, fruit is meant to be eaten: the plant’s survival relies on the fruit being eaten so the seeds can be consumed and dispersed. Thus, many plants have evolved to bear luscious, colorful fruits which capture our attention even from great distances. Fruits have also evolved to contain vast amounts of nutrients which we animals need for survival. This is all part of the wonderful symbiotic relationship that we have with plants: they provide nutrition for us and we help disperse their seeds. Formally called Monstera delicious, this member of the philodendron family goes by many names including the “Swiss cheese fruit” and “Mexican breadfruit.” The fruit is native to Central America and takes about a year to ripen inside of a beautiful white flower. Until it ripens, the monster fruit contains high amounts of a toxin called oxalic acid which can cause swelling, blistering, and even death. You will know that the fruit is safe to eat when the hexagonal outer scales begin to fall off revealing a sweet, custard-like fruit which gets eaten inch-by-inch. This West African fruit is an amazing feat of evolution. It contains a molecule called miraculin which makes it – and everything else – taste sweet. The effects of the miracle fruit last for about 30-90 minutes. Try eating something savory afterwards and it will take your taste buds for a loop! Mangosteen contains a recalcitrant seed, meaning its seeds won’t survive cold temperature or drying. Thus, the hard shell of the mangosteen protects the fruit until it is ready for germination. Up until 2007, importing mangosteens was banned in the US out of fear that invasive insects would ride in on the fruit. Now, the fruits are available in specialty stores – so long as you are willing to pay the high price tag. 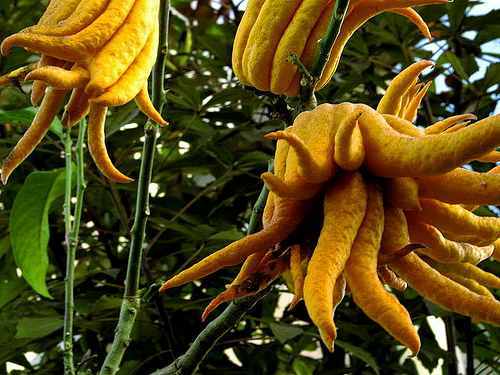 In a world in which nature tends to show itself in patterns and symmetry, the crazy-looking Buddha’s Hand certainly stands out! The plant, thought to be a native of India or China, gets its name because it was regularly given as an offering to Buddha at temples. The fruit can be used for its rind (similar to lemon) but is mostly used for decoration. The horned melon, also called the African horned cucumber and kiwano, is an ancestor to the modern-day melons we eat. The fruit is green until it ripens. Then it turns a gorgeous bright yellow color as a calling for us animals to eat it. Cupuacu is a relative to chocolate and grows in the Amazon. Monkeys and birds love the sweet fruit inside, so the plant has developed a hard outer shell to protect its seed pods until they are ready for germination. When the fruit is ripe, the pods drop to the ground where animals – including people – can gather them and enjoy the delicacy. When unripe, the pitaya fruit – or dragon fruit – is the same green color as the cactus it grows on. As it ripens, it turns a magnificent pink color which is sure to get the attention of hungry animals in the area. Pitaya taste wonderfully sweet and are loaded with the cancer-fighting antioxidant phytoalbumin. However, the real reason that these fruits are so popular is because of their gorgeous appearance. The fruit of the mamey tree is another example of a biological anachronism: the giant sloths which used to eat the fruit are now extinct and there are now no animals which can swallow its giant seeds. Mamey has an amazing taste and succulent fleh so we humans have helped keep the species from extinction through cultivation. This wine-borne fruit which is native to northern Japan looks like a bit like a big plum. When you open it up though, it contains a strange translucent flesh similar in texture to lychee. Akebia fruit isn’t very sweet, so it probably had to evolve into its purple color in order to attract animals to eat it. If you are a plant that needs to protect your immature seeds, then becoming poisonous is one very effective way of doing so. This is exactly what the Ackee plant did. The unripe fruit contains toxins which can cause hypoglycemia in humans. Once the seeds are mature though, the fruit opens up and can be safely eaten. However, the seeds are always toxic to humans, and thus the plant is treated more like a vegetable than a fruit. Ackee is originally from West Africa but made its way over to the Jamaica (likely on slave ships) and is now the country’s national fruit. It is also considered one of the deadliest foods in the world. The reason that durian is so strange is because it is the largest tree-borne fruit in the world. However, the jackfruit is better known for its foul stench of decay. This stench is actually what attracts animals – but many of these animals won’t be able to penetrate the hard outer skin of the jackfruit to get to the sweet flesh inside. Even the seeds of the jackfruit are too large to pass through the digestive tracts of most mammals: the giant mammals which originally ate the jackfruit are now extinct.